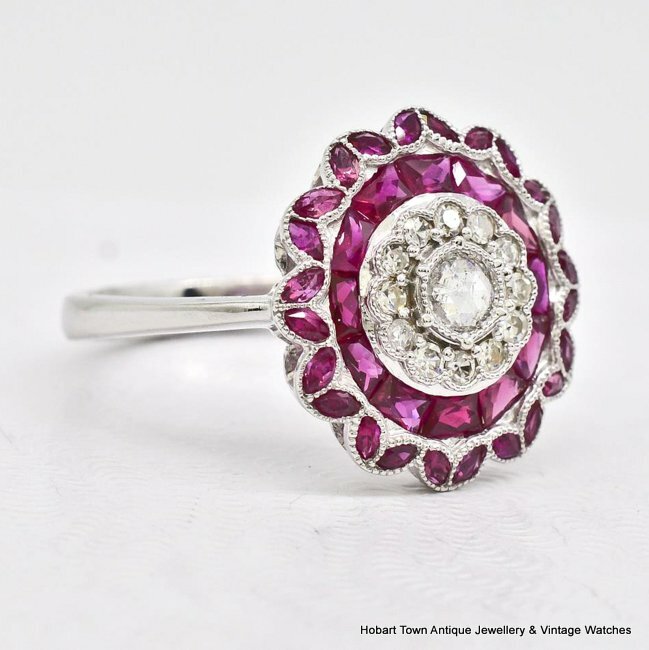 A beautiful Art Deco Ruby Diamond Multi Gem Style White Gold Ring in 14kt white gold. 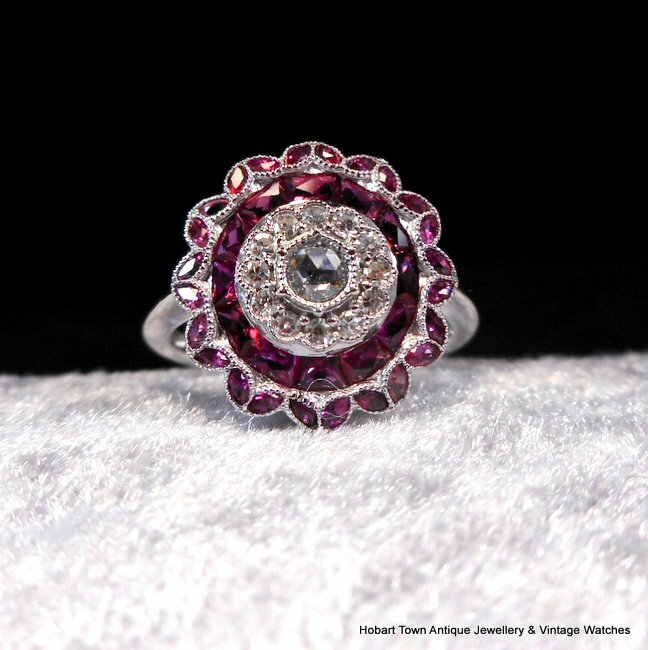 An est; 1.38 cts of diamonds and natural rubies ……… and being sold a genuinely great price! This Art Deco Ruby Diamond Multi Gem Style White Gold Ring is one eye catching and stunning ring! 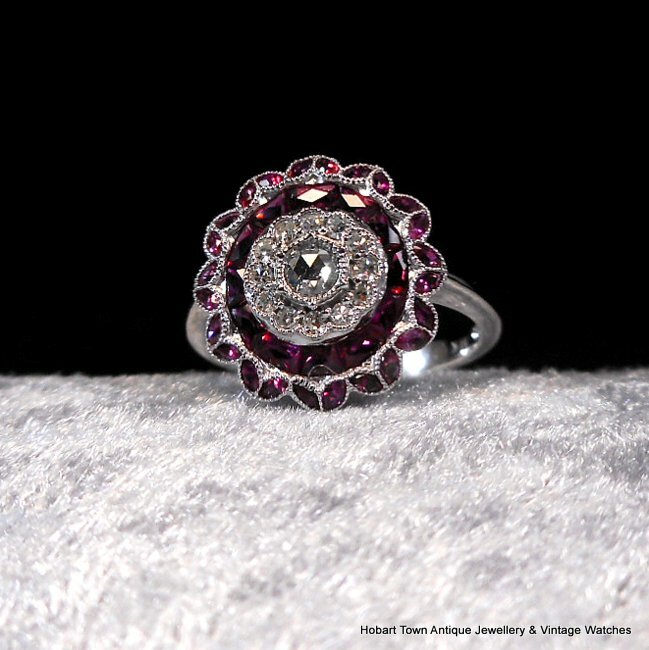 Such a complex design and featuring no less than four different cuts of gemstones , French and Marquise cut Rubies and Rose cut central diamond and round cut accent diamonds. Looking every bit the 1920’s / 1930 art deco classic ring ~ while in fact this eye caching ring is a contemporary ring made within the past 10 years … to an exacting art deco design by a very talented U.S. jeweller. 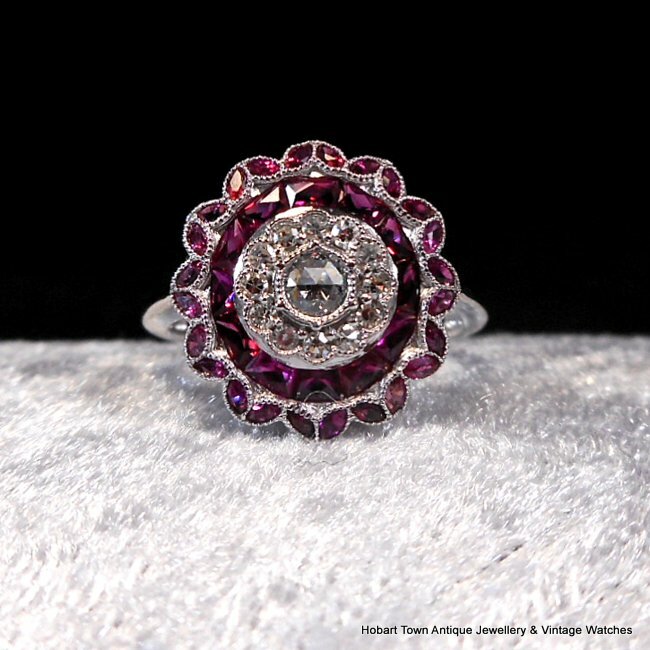 Set with approx; 1.38 cts of mixed ruby and diamond gemstones with the center diamond being an approx; .15ct mine cut diamond and a further .13ct’s of diamond accents. Approx; 1.10ct’s of natural rubies provide the amazing pattern to this Art Deco Ruby Diamond Multi Gem Style White Gold Ring. With a VS2 grading to the diamonds and eye clean Rubies! 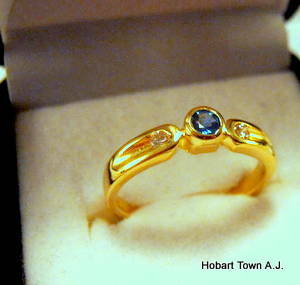 Hallmarked & Tests at 14kt gold and a good size at U.S. ‘7’ or Oz size ‘N’ and can be resized if needed. Also a good size of 15.5m design width. 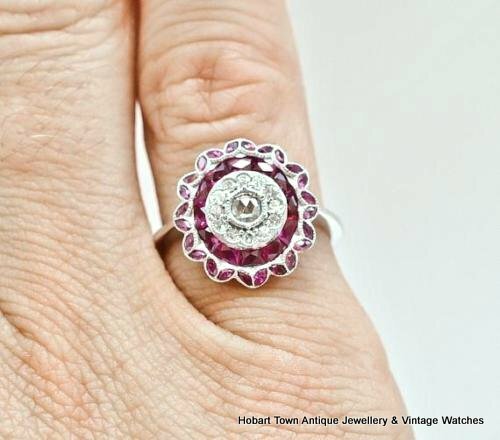 This is a beautiful ring and although the actual ring was not made c.1930 ~ it certainly is of fine quality and presents every bit as period deco ring! 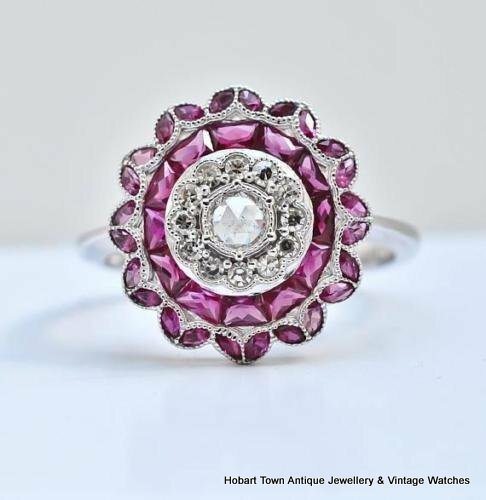 This stunning Art Deco Ruby Diamond Multi Gem Style White Gold Ring is in ‘perfect’ condition and has no issues with mounts etc. NOTE: the 2 different types of images …. 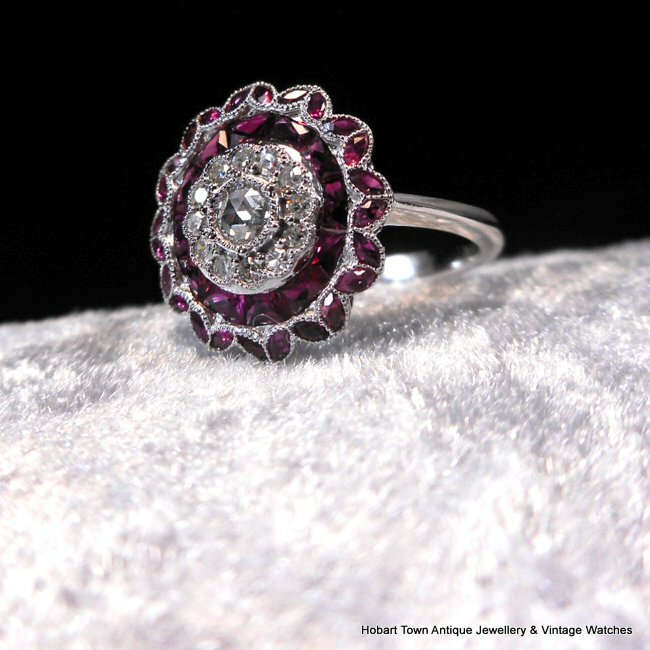 one group taken with white background and very different lighting , the other with black background and therefore darkening the colour of the rubies. 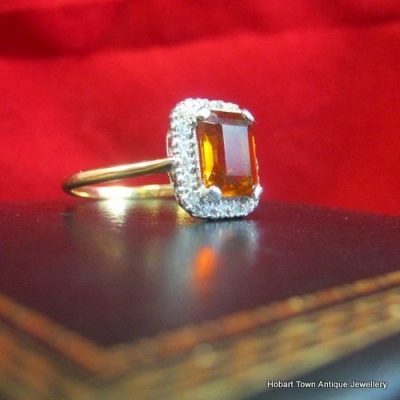 The “on hand colour” is lighter than the black background portray ~ and darker than the strongly lit , white background pic’s. The colour of the rubues will certainly never disappoint , they present beautifully ! 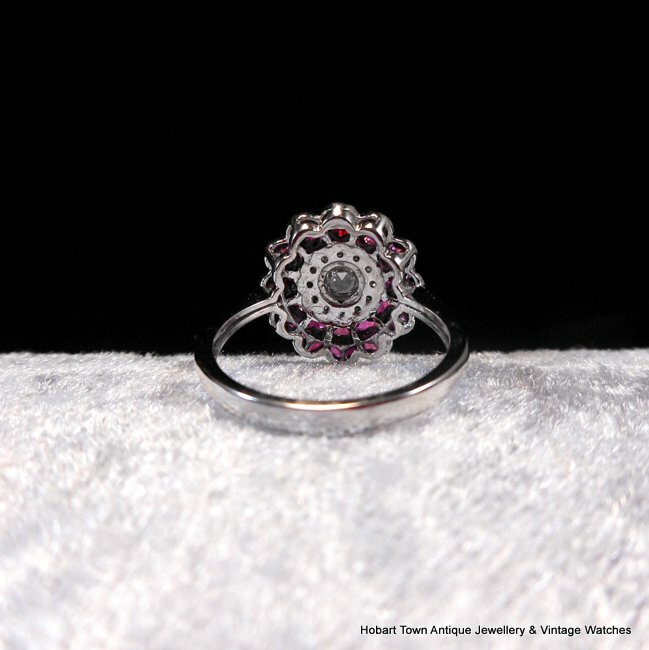 Priced to tempt any lady that see’s this listing , as we often do …………. 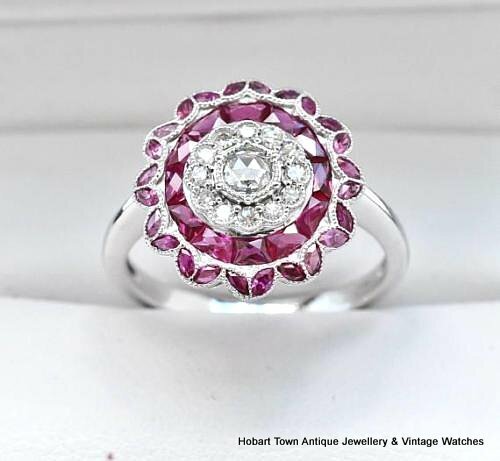 we encourage you to compare both the ring , it’s price and the value it offers when compared to most equal rings on the Australian market. 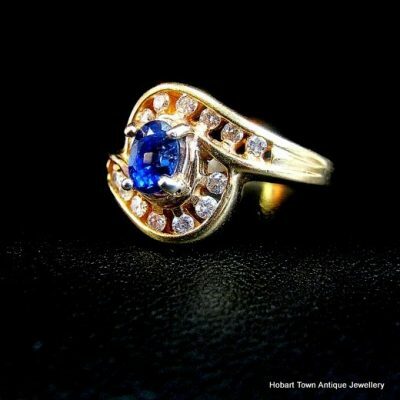 Please email with any questions or to purchase. 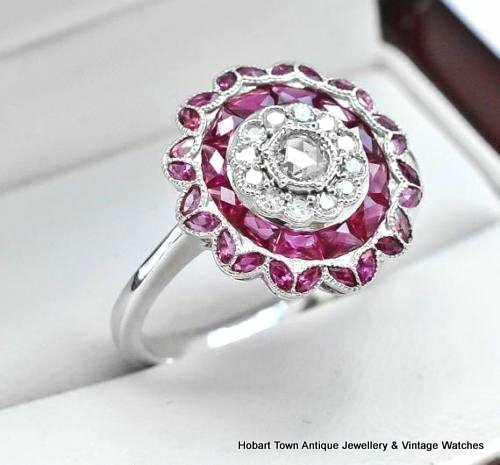 I would think that this handsome Art Deco Ruby Diamond Multi Gem Style White Gold Ring may be popular.